Image taken by ALMA of the dust ring that surrounds the young star Sz 91. This ring is primarily made up of mm-sized dust particles. 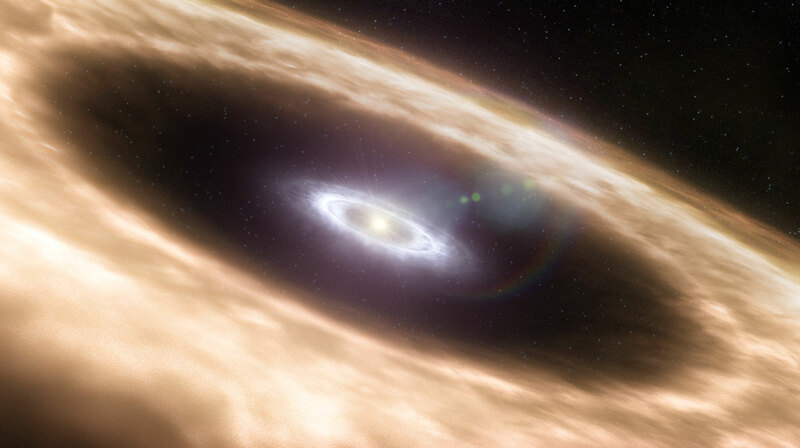 The interaction between several recently formed planets and the protoplanetary disk that still surrounds the star probably generate the dust ring observed by ALMA. 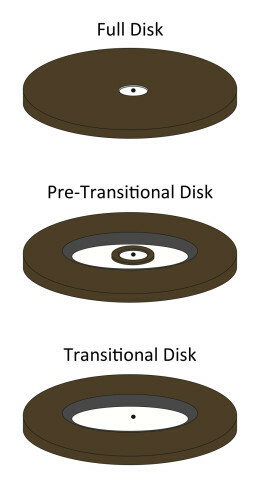 The results obtained show the first disk around a star that is less massive than ours – it has only half of the mass of our Sun – which simultaneously presents a migration of dust particles from the outermost zones and evident signs of interaction between young planets with the disk in the innermost zone. Planets are born in dust and gas disks that surround young stars and feed them with matter, leaving a “footprint” of this interaction in the structure of the disk. The theoretical models that study this interaction predict that the planets carve the protoplanetary disk, creating a “hole” in the innermost part of the disk, and preventing mm-sized dust particles (like grains of sand on a beach) from continuing their journey towards the central star. At the same time, dust particles in the outermost parts of the disk (the farthest from the star) are attracted by the gravitational force of the star. The combination of both effects should create dust structures in the form of a ring in disks that host recently formed giant planets on the inside. “The sharp image from ALMA shows a ring around the young star. And it is a surprisingly large ring, over three times the size of Neptune’s orbit (a radius of approximately 110 astronomical units (AU)” explains Héctor Cánovas. The image from ALMA only shows the ring, as the radio telescope detects the cold dust particles that make it up, and not the planets and the star, as these are primarily made up of hot gas. “Based on the current paradigm of planet-disk interactions, only giant planets orbiting the innermost parts of the disk can explain the presence of a ring with such a large radius,” indicates Antonio Hales, ALMA astronomer and member of the research team. The accumulation of dust particles in a narrow annular structure, as is the case with Sz91, can favor the formation of more planets, because the high density of dust particles in the ring would provide the ideal conditions for the dust particles to agglutinate and grow in size until they form small planetary nuclei. “The results of this investigation show that Sz91 is a highly important protoplanetary disk for the study of planetary formation, planet-disk interactions, and the evolution of these disks around stars of lower mass, as Sz91 shows evidence of all these processes simultaneously,” concludes Matthias Schreiber, coauthor of the study. This investigation was presented in an article entitled A ring-like concentration of mm-sized particles in Sz 91, written by Héctor Cánovas and collaborators, which will soon be published in the specialized journal Monthly Notices of the Royal Astronomical Society (MNRAS). The research team is made up of Héctor Cánovas, Claudio Cáceres, Matthias Schreiber, Adam Hardy (all from Universidad de Valparaíso and from the Millennium ALMA Disk Nucleus (MAD), Chile), Lucas Cieza (Universidad Diego Portales and MAD, Chile), Francois Ménard (Universidad de Chile) and Antonio Hales (JAO-ALMA, Chile). Astronomers have been able to study planet-forming discs around young Sun-like stars in unsurpassed detail, clearly revealing the motion and distribution of the gas in the inner parts of the disc. This result, which possibly implies the presence of giant planets, was made possible by the combination of a very clever method enabled by ESO’s Very Large Telescope. Planets could be home to other forms of life, so the study of exoplanets ranks very high in contemporary astronomy. More than 300 planets are already known to orbit stars other than the Sun, and these new worlds show an amazing diversity in their characteristics. But astronomers don’t just look at systems where planets have already formed – they can also get great insights by studying the discs around young stars where planets may currently be forming. “This is like going 4.6 billion years back in time to watch how the planets of our own Solar System formed,” says Klaus Pontoppidan from Caltech, who led the research. “Our observations with the CRIRES instrument on ESO’s Very Large Telescope clearly reveal that the discs around these three young, Sun-like stars are all very different and will most likely result in very different planetary systems,” concludes Pontoppidan. “Nature certainly does not like to repeat herself” . “These kinds of observations complement the future work of the ALMA observatory, which will be imaging these discs in great detail and on a larger scale,” adds Ewine van Dishoeck, from Leiden Observatory, who works with Pontoppidan. Astronomers used a technique known as spectro-astrometric imaging to give them a window into the inner regions of the discs where Earth-like planets may be forming. They were able not only to measure distances as small as one-tenth the Earth-Sun distance, but to measure the velocity of the gas at the same time . “The particular configuration of the instrument and the use of adaptive optics allows astronomers to carry out observations with this technique in a very user-friendly way: as a consequence, spectro-astrometric imaging with CRIRES can now be routinely performed,” says team member Alain Smette, from ESO . Pontoppidan, K. M. et. al. 2008, Spectro-Astrometric Imaging of Molecular Gas Within Protoplanetary Disk Gaps, Astrophysical Journal, 684, 1323, 10 September 2008. Team members are Klaus M. Pontoppidan, Geoffrey A. Blake, and Michael J. Ireland (California Institute of Technology, Pasadena, USA), Ewine F. van Dishoeck (Leiden Observatory, The Netherlands, and Max-Planck-Institute for Extraterrestrial Physics, Garching, Germany – MPE), Alain Smette (ESO, Chile), and Joanna Brown (MPE). The discs are about an hundred astronomical units (AU – the mean distance between the Earth and the Sun, or 149.6 million kilometres) across, but the stars are more than 200 light-years away (one light-year is 200 000 AU). To resolve structures on 1 AU scales in these systems corresponds to reading the license plate on a car at a distance of 2000 km – roughly the distance from Stockholm to Lisbon. 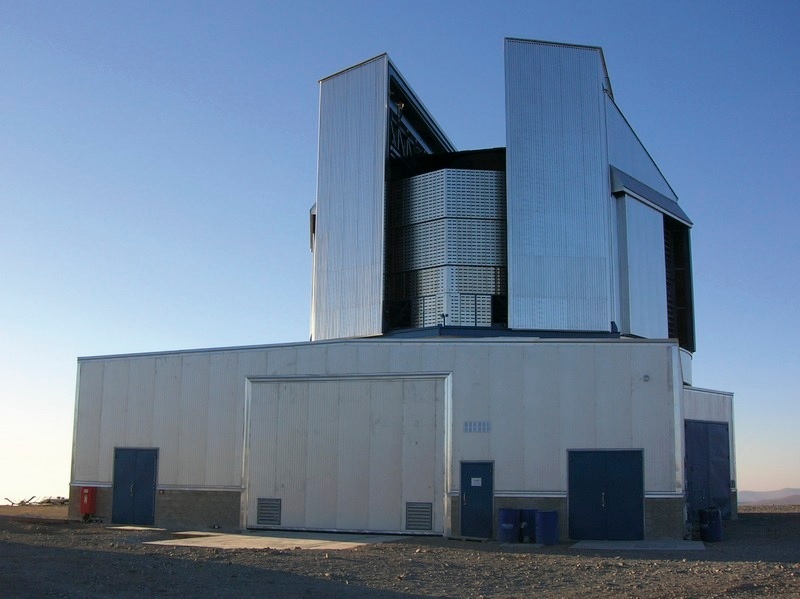 CRIRES, the near-infrared spectrograph attached to ESO’s Very Large Telescope, is fed from the telescope through an adaptive optics module which corrects for the blurring effect of the atmosphere and so makes it possible to have a very narrow slit with a high spectral dispersion: the slit width is 0.2 arcsecond and the spectral resolution is 100 000. Using spectro-astrometry, an ultimate spatial resolution of better than 1 milli-arcsecond is achieved. 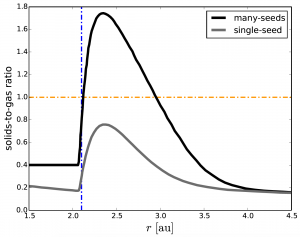 The core of the spectro-astrometry imaging technique relies on the ability of CRIRES to be positioned very precisely on the sky, while retaining the ability to spread the light into a spectrum so that wavelength differences of 1 part in 100 000 can be detected. More precisely, the astronomers measure the centroid in the spatial direction of a spectrally resolved emission line: effectively, astronomers take a sharp emission line – a clear fingerprint of a molecule in the gas – and use data from several slit positions to locate the sources of particular emission lines, and hence to map the distribution of the gas with much greater precision than can be achieved by straightforward imaging. The astronomers have obtained spectra of the discs centred at wavelengths of 4.715 microns at 6 different position angles. Led by Colette Salyk (NOAO and Vassar College), the authors examined the system using the Texas Echelon Cross Echelle Spectrograph, a visiting instrument on the Gemini North telescope. They discovered that the water vapor emission originates from about 0.3 AU — the inner disk region, where terrestrial-type planets may well be forming.